Why is Gran Melia Palacio de Isora best holiday resort Spain Tenerife 2011 ? The 5 star Gran Melia Palacio de Isora Resort has been a 2011 winner. It is one of top Tenerife south resorts besides Abama Golf and Gran hotel del Duque. This Tenerife oasis has established itself by 2012 within only five years as best holiday resort of Spain as per 4th edition by the Condé Nast traveler review. This premium travel award by the elite magazine was awarded on May 02,2012 in Madrid. Why did the Gran Melia Palacio de Isora win? People voted on total qualities of the hotel. That included its services, varied cuisine of eight restaurants, YHI spa treatments and organized resort activities besides sports. Entertainment as well as environmental features added to the top score. The huge Melia Palacio of Alcala is located by the Atlantic ocean. Get there after 5 km from Los Gigantes. 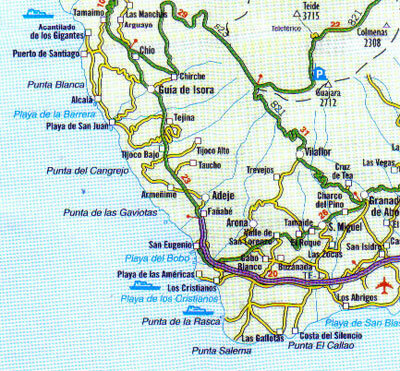 Locate the resort on the Alcala regional map , as depicted beside. This Atlantic ocean oasis faces La Palma and stunning sundowns on a clear night by the sea. It is backed by mighty Mount Teide which can be reached within three quarters of an hour, easily. Consider about half an hour's drive to the South Airport TFS Reina Sofia. Reach Siam Park of Costa Adeje in about 20 minutes. Its water attractions belong to world best. Everything in this applauded vangard ocean front Hotel of Alcala Guia de Isora is big. Its size may not be everybody's idea of a cozy vacation. It definitely is not the typical romantic ocean front retreat, while only its Red-level Suites which cost about Euro 100 more per night may come close. But, you will almost feel like in a tropical island oasis. Also, the many pagodas whose roofs look grass thatched give a romantic touch which is rather typical for Caribbean or Indian ocean enclaves. Some of these structures on stilts are partly submerged by water.. They and others which are on tiny man made isles break the monotony of the big, artificial lakes whose total blue water area is 7500 square meters. Its biggest pool takes up 5000. Just figure that this is a surface of 53819.5521 square feet of salt water. All represents an utterly relaxing and soothing environment which blends in perfectly with nearby nature. The Gran Melia Palacio Hotel of Isora which received the best holiday resort Spain 2011/2012 of the Madrid Conde Nast Traveler award. From Gran Melia Palacio de Isora back to Tenerife hotels in North and South.